Sontag has made what seem to be rather conservative--and perhaps revisionist--choices in this sampler of Barthes' work, stressing complete short essays (presumably in the interest of wholeness) over sections of Barthes' longer and more radical works (Writing Degree Zero, S/Z, The Pleasure of the Text, Camera Lucida). Not that she glosses over basic Barthes, for her introductory essay presents the ideas clearly. 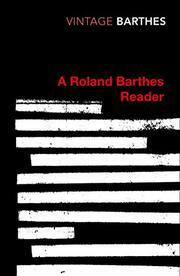 "Barthes is always after another meaning, a more eccentric--often utopian--discourse." She notes, too, his "aphorist's ability to conjure up a vivacious duality: anything could be split either into itself and its opposite, or into two versions of itself; and one term then fielded itself against the other to yield an unexpected relation." In this connection, Sontag updates her early interest in "camp" to encompass Barthes' more complex aesthete's penchant for liking more than he actually does, for seeming to be emptier and less personal than he really is. This is shrewd analysis, but the Barthes that Sontag thus gives us somehow comes off as slightly flitty; he is hardly the man who--with his insistence on writing as a "closed" or "hardened" system of language, not as communication--has perhaps done more than anyone else to elevate the critic to prima donna status (while suctioning out the flesh of literature). As if Sontag herself suspects this, she stresses Barthes' late stirrings of misgivings (what she calls his "taking pleasure, expressing love" for the world, as opposed to only system). And she makes much of one of the two heretofore unpublished pieces collected here: Barthes' address to the College de France upon his election to its faculty--in which he definitely does seem to be backtracking, putting emphasis on "literature" rather than on text. . .and nearly apologizing for semiology ("a kind of wheelchair, the wild card of contemporary knowledge"). The signals, then, are decidedly mixed here--Sontag's even more than Barthes'--but all the brilliance and outlandishness (and maybe even the self-destructiveness) of the Barthesian theory is well represented in this compendium.